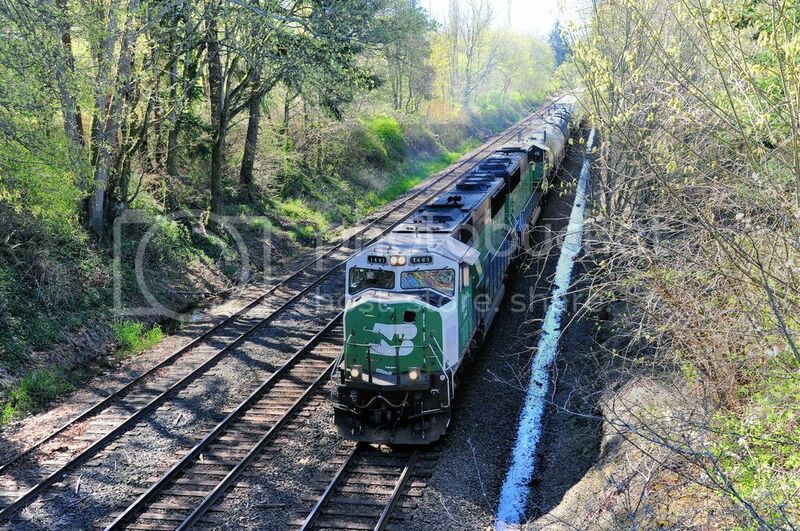 The rail slip at Nanaimo. 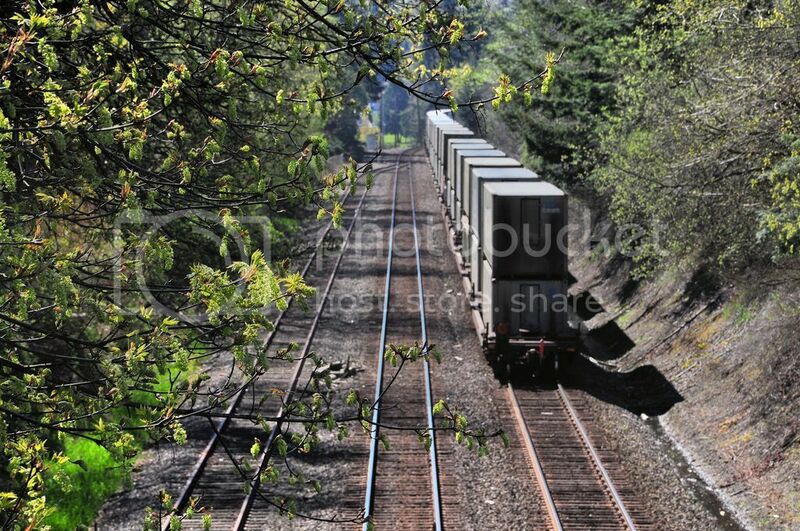 Rail slip at Powell River, BC. This is a mill only operation. Heads up, the 1st Rocky Mountaineer Coastal Passage train will be operating from Vancouver BC to Seattle and return on Saturday May 23 just heard the news from a trusted source. 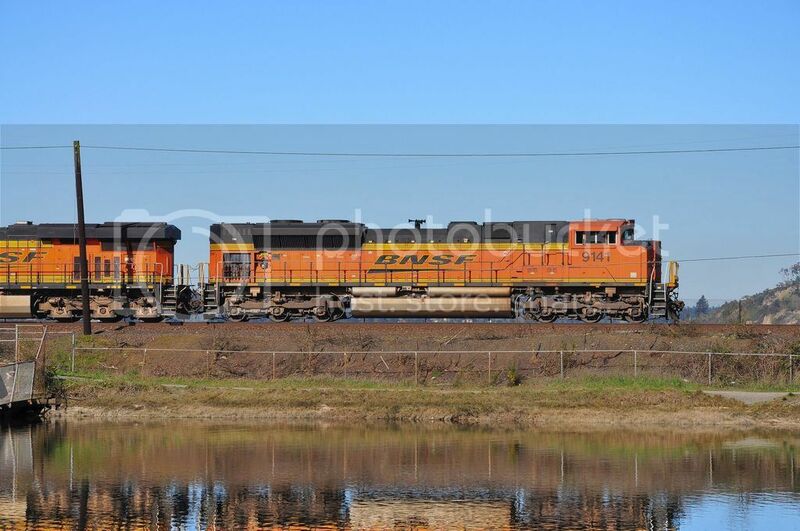 Will likely be 2 GP40-2's and 7 cars. 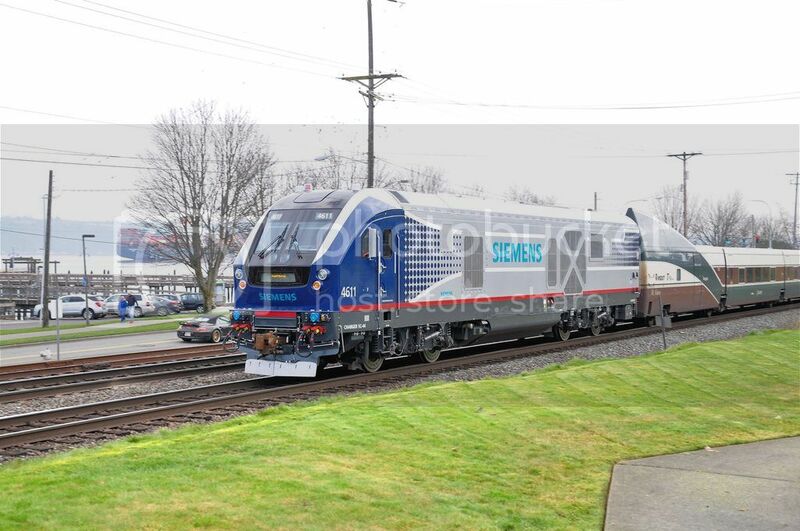 I have taken several photos from Sunset Ave. of the Rocky Mountaineer passing through Edmonds. I was hoping you could take one from the water. 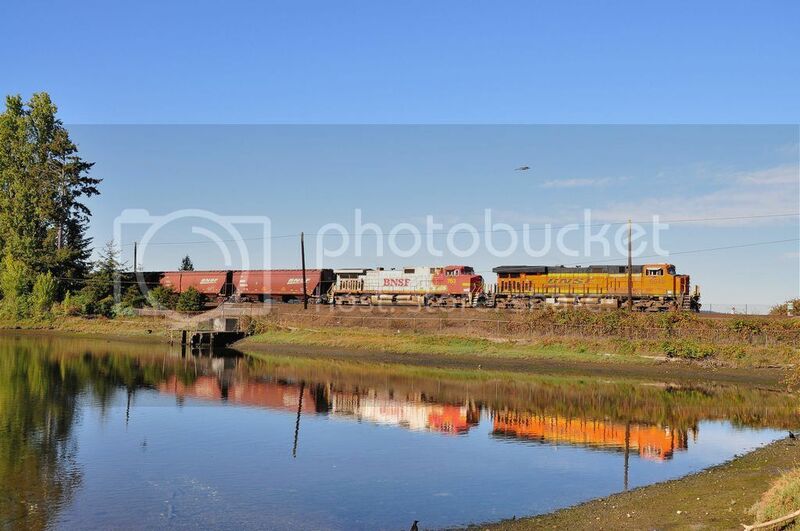 It would have been nice back in the day to have taken some shots of the R M on a calm sunny afternoon near Picnic Pt. Can't believe it has been about 18 months since I stepped of the boats and I still don't miss it, other than the afore mentioned activity of taking photos. I'm not getting out as much as I thought I was going to and now the US Open has Chambers Park shut down for the most part until the game is over and they can clean up the place. Oh well, the wife has managed to keep me busy in the meantime. This is a photo from the upper trail of the parking lot and pedestrian overpass to the beach. There has been no public access to the lower park for over a month, maybe two and I don't see any until the end of June. Isn't the Chamber's Bay property a Pierce County public park? Nice that the public can be excluded for months at a time. I'm still around, just not getting the track time I had hoped for. On Wednesday the wife told me to go to the tracks relax, needless to say I didn't question her sanity and did as I was told. 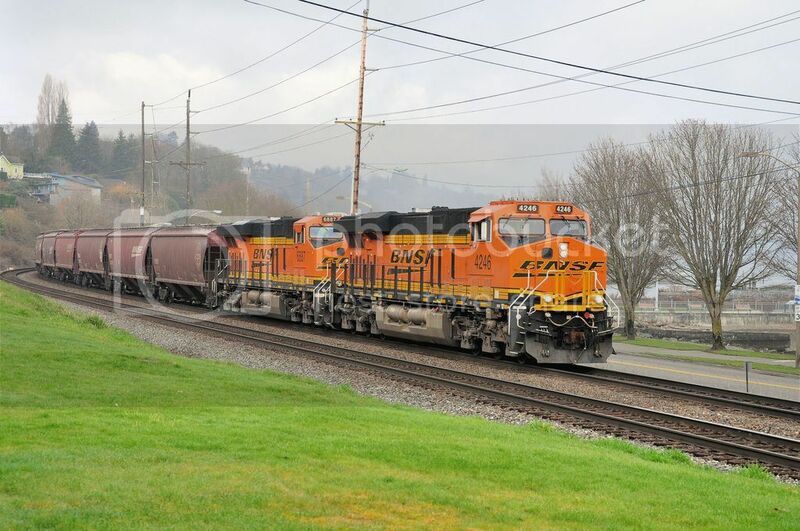 BNSF 9141 leads a NB grain train past the Titlow Water Park. 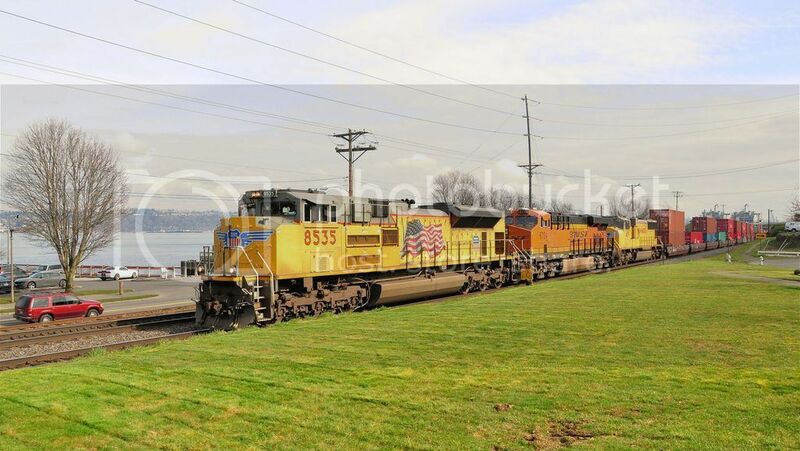 A pair of SD60M's in almost pristine BN paint NB along the shores of the Tacoma Narrows. 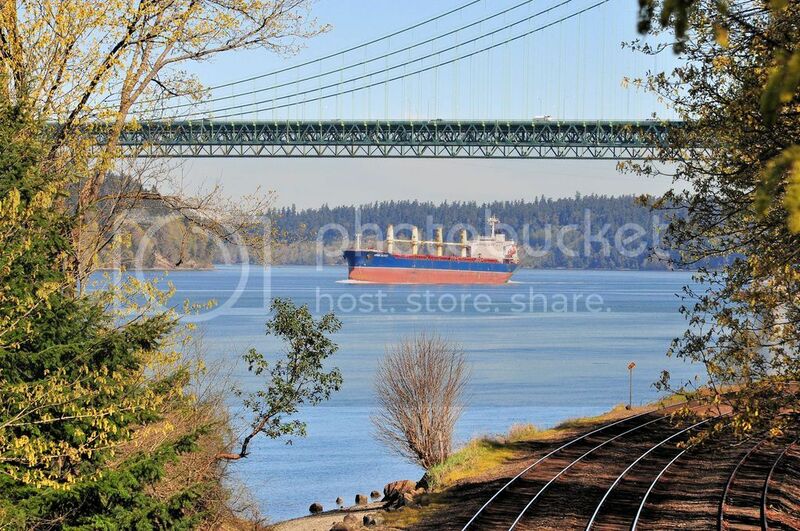 A pleasant surprise, a ship passing through the narrows on its way to Olympia, WA. This is a rare daylight transit. 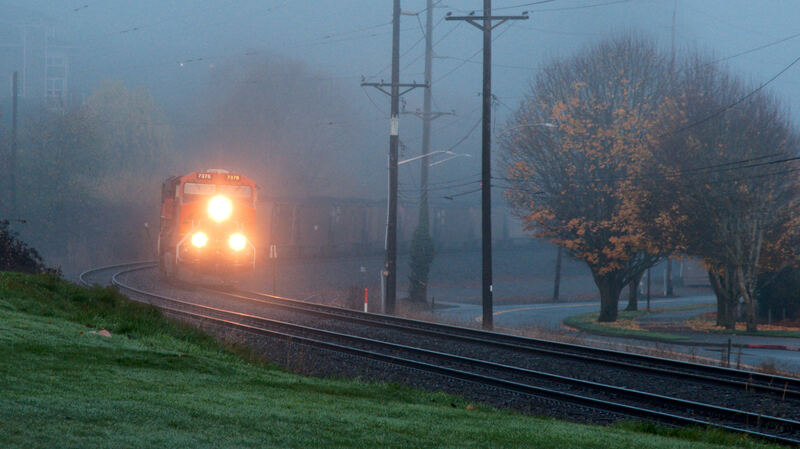 And sometimes "auto focus" can create a neat photo. Nice shot with Bridges #2&3 in the background. If you like, I could send her a complete itinerary so she could send you on your way. Art, No thank you, I can get in enough trouble on my own. Thanks for the kind words. I'm gong to have to try and get to this spot in the Fall when the leaves are changing. Good to see you back. 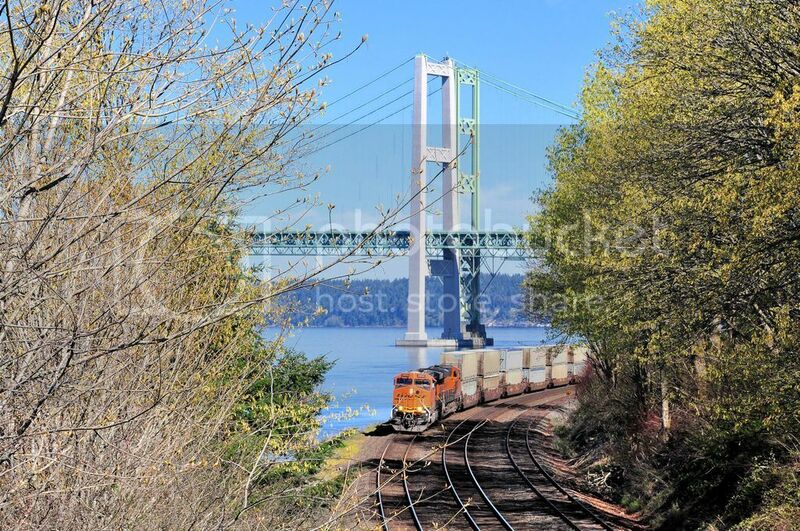 Why is a daylight transit of a ship under the Narrows Bridge unusual? Is it the tides? Bill, Yes, it's been a while. Tide does play a part in some inbound ships and most outbound. Most departing ships are loaded and want to have as much water under them when they depart as Olympia is a relatively shallow port compared to Seattle and Tacoma. It also gives them the advantage of riding the ebb tide most of the way to the Pilot station. Most arriving ships, as a rule are empty and are not too concerned about tide unless it is an extreme low water. I really have no idea if there are more night time than daylight movements, but when I was working my 15 days, if we had to go to Olympia, it was 80% of the time going to be at night and usually a midnight or 0200 arrival or departure. Another fun fact about ships going to Olympia is: Most ships can get from the Pilot Station to Budd Inlet in about 10 to 11 hours depending on tide. Then they have to pick up the tugs, maneuver through the channel, turn in the turning basin and be put it to the dock. All that adds another hour and a half or two hours. Throw in a little fog or the unexpected and your over 12 hours. It is a Federal Law that no pilot, or any licensed deck officer, can work more than 12 hours in a 24 hour period, so two pilots are required to make the trip. The first pilot gets on at PA or Oly and takes the ship to near Alki Point in Seattle, Arrow Launch will bring out the relief pilot and take the other ashore and the ship will continue on its way. John, are you still out there? I miss your photos of the South Sound, even though you are no longer able to take them from the bridge of your tug. Yes, I'm still around. We spent most of the summer doing a remodel that was planned for about 18 months from now, but a very small water leak in the wall of the laundry room moved things up. Needless to say trains were not on the to do list. In October we did take a trip to Morro Bay CA and stopped by San Luis Obispo. Didn't have much time to wait for train, too many other things to do. 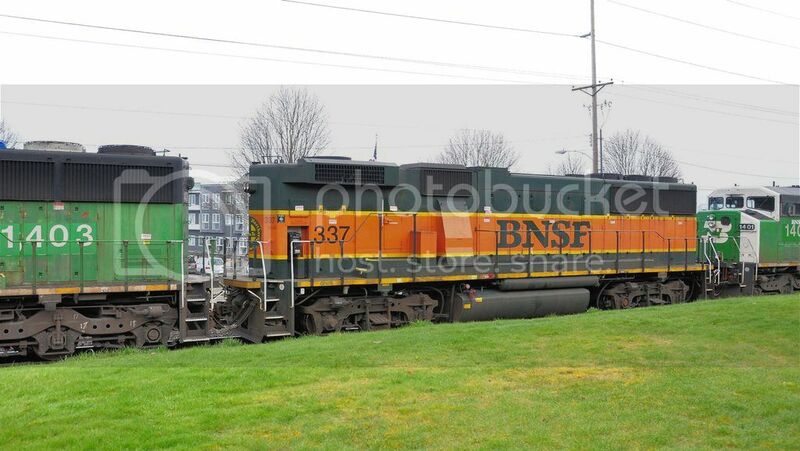 I hope to get some time at the tracks before the holidays. 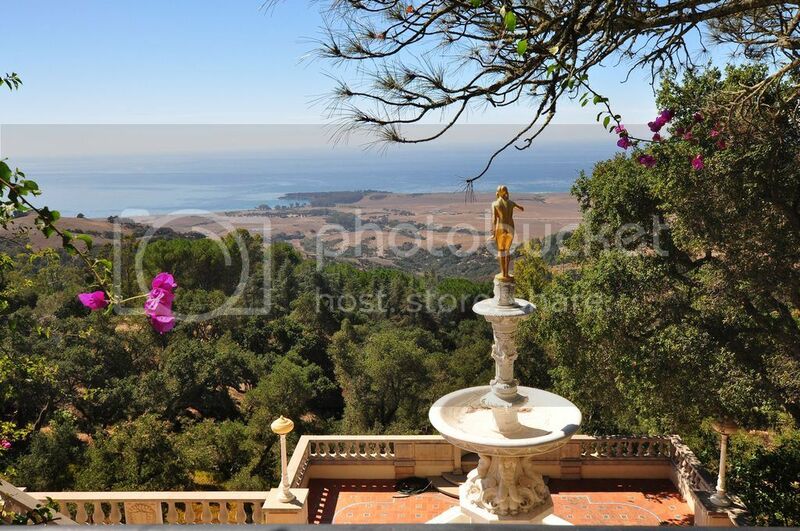 The view from Hearst Castle. If I could wake up to a view like this every morning I'd be happy living in a tent. 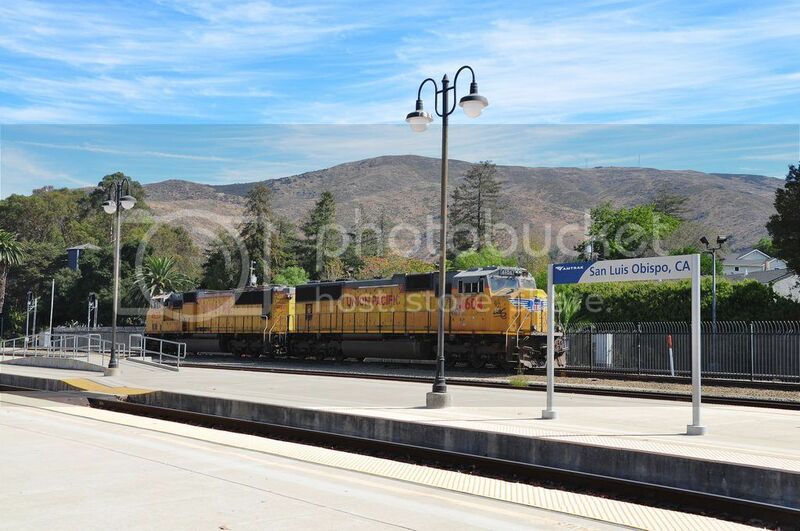 A Day at the Tracks. 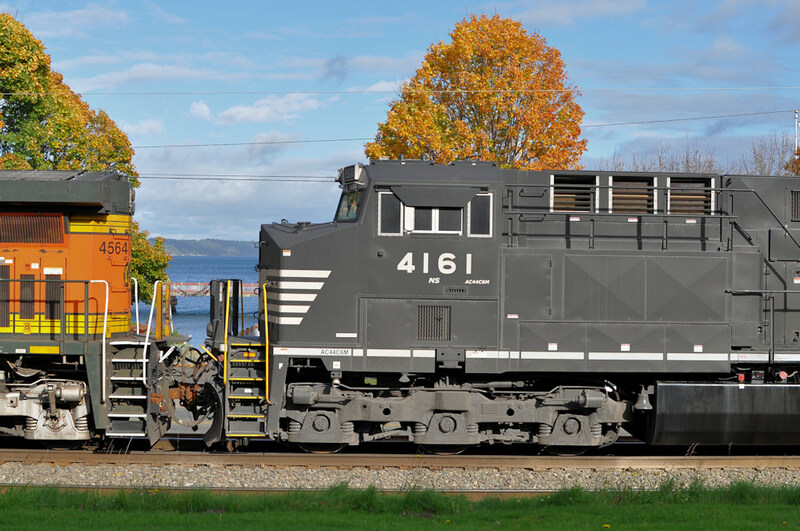 I went to Mc Carver Street in Tacoma today on the hopes of a sunny day and while not perfect, the 15 trains in four hours was a pleasant surprise. 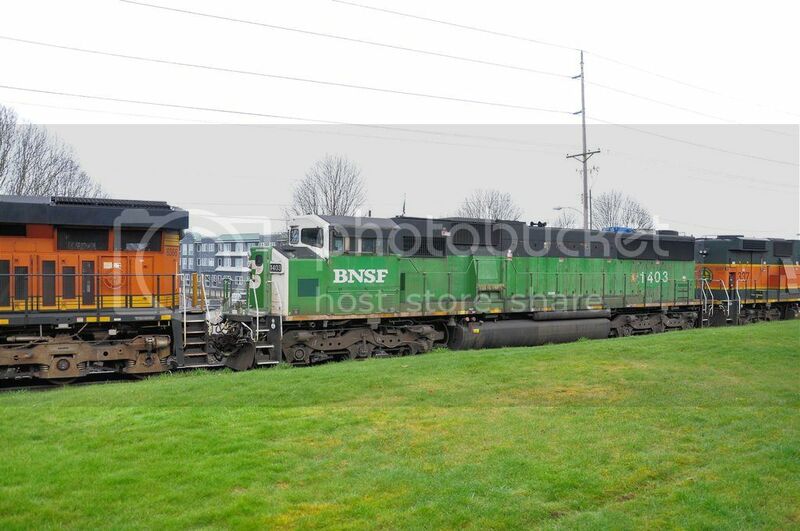 This is one of four northbound grain trains. 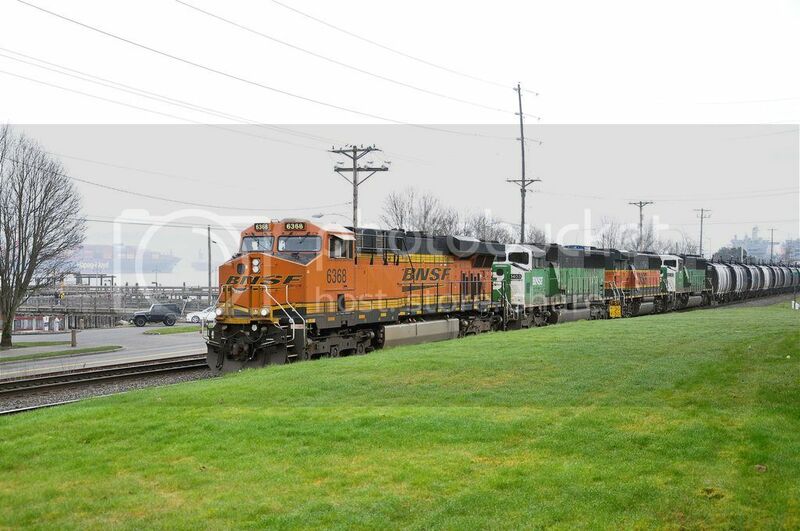 The Everett to Vancouver had an interesting consist: A ES44AC, two SD60M's and a GP60B. UP must have been short on power. The Siemens Charger SC-44 testing. Glad to see you posting photos again. ...If I could wake up to a view like this every morning I'd be happy living in a tent. I say we take up a collection and buy John a naked-lady statue of his very own. That way he won't have to buy a tent. Does it have to be a statue? My pictures are back. Ha, it appears Photobucket's attempt at extortion didn't pan out too well. I may start posting now that this thread makes sense again, it was pointless without photos. Still retired and enjoying it and still going to the tracks when I can. Welcome back. Glad to see your photos once again. Hi Bill. 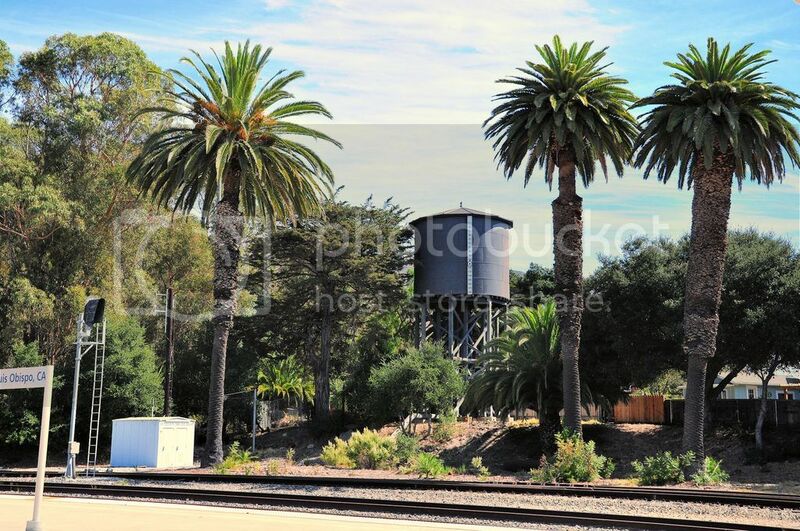 I'm glad my photos are back, not pleased with the hideous water mark, but I'll get over it. I didn't see much point in posting more photos to the thread with the others gone, but now I'll start adding. Don't feel bad. A big portion of my old photos got wiped out when Bob switched to the new format. You just move on and take more photos.